I’ve been through all the big life shaking events recently – stroke, heart op and cancer. For each and any of these humdingers, you’re going to have questions. How what when where. But mostly why. Some of them are just going to be too big to answer. Sometimes you will have to ask the question over and over and over again. Sometimes you won’t want to hear the answer. None of it is easy. I can’t stress how important it is to get to know your Doctor at this time. In fact, don’t wait until crisis hits, start building that relationship now. I first met my Doctor when I was four. The scene is Cumbernauld Safeway. The ruse was that we were shopping for Easter Eggs, all very banal so far. Until we got to the checkout. There he was, in the cashier’s chair, Tom Baker, my Doctor, dressed in his famous hat and scarf. The Doctor. I understood what was happening immediately. 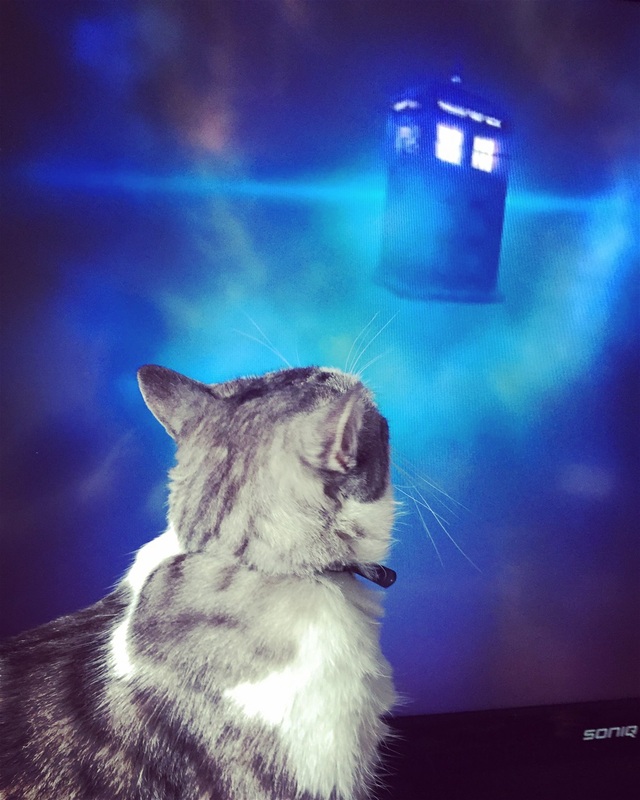 I was worried my family would be sad saying goodbye, but The Doctor had finally come for me, and as his new companion, there was much more important work to be done than Easter Egg shopping. I was hoiked up onto the conveyor belt where you would normally load up your groceries and trundled along on that black rubber mat to my destiny. A giant hand clamped down on my head completely enveloping it, an even bigger voice boomed above. It was a frequency beyond anything my small boy ears could decipher causing my stomach to rumble and a little bit of sick to fill my mouth. It was like being pushed underwater. Above the waves, I could hear my mum’s more familiar voice. “He watches your show every week”. Show? SHOW? A switch was flicked. The clouds parted. The difference was day and night. A cleaver came down between reality and TV. This was all make-believe. It was a TV show. I was not going to be the new Companion. He wasn’t even The Doctor. Oh my God, there isn’t actually a Doctor! I’m not sure I ever really recovered, in fact, I’ve probably been running from the truth of that day ever since. Set the dial to fast forward twenty years into the future [insert your own asthmatic time travel sound here] and I had the chance to meet my Doctor again as he was doing a book signing at Waterstones. When it was my turn at the front of the queue, I cheekily asked the now white-haired Tom (because, you know, he’s my Doctor and I can call him Tom) if he remembered our last meeting and if he had any time to reconsider whether I might yet become his companion. I was happy to accept that that there wasn’t really a TARDIS, but I could make myself useful making tea and potting plants in his garden if he thought that would be of some help? His entourage enjoyed the moment and chuckled, Tom, however, was less amused and took a step back from the table. I was just another weirdo to him, and let’s face it; the poor man has had many approach him. He was right to be wary. Who am I to him? He’s still my Doctor though, always will be. You never forget your first. I recently had the opportunity to let my own boys meet their Doctor, Peter Capaldi. I say ‘their Doctor’ but it all really began for them with David Tenant. My generation was lucky; Tom stuck around for the best part of seven years. He was all we knew. These days as soon as a Doctor has found their rhythm, settled into a character, developed their own little idiosyncrasies and found their niche, they’re off. They don’t seem to give it any time at all. Perhaps they had all seen the trap that Baker had built for himself, typecast out of a career beyond The Doctor? 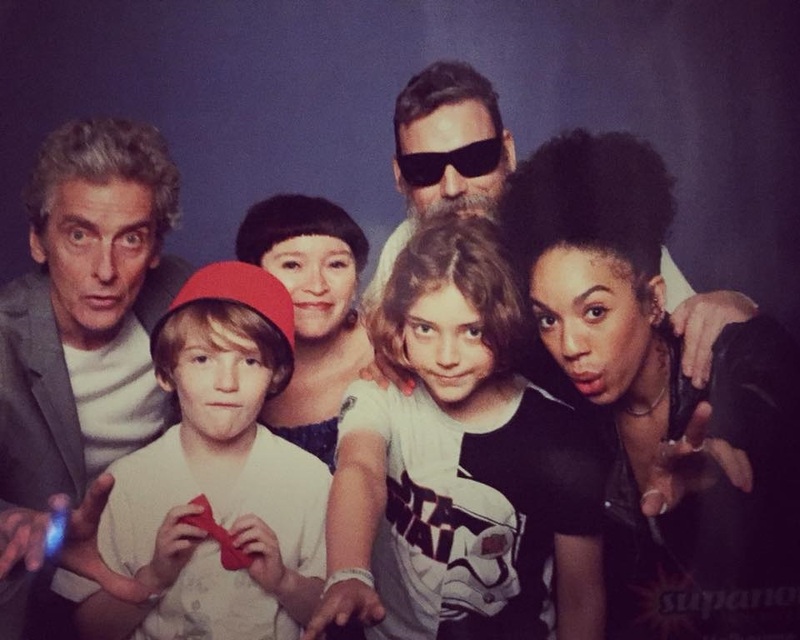 But, despite his tenure already being over, Capaldi, older, cantankerous, curmudgeonly and so very short-lived, nevertheless found his way into all our hearts in the role, and the opportunity to meet him recently at Supernova (and have a family portrait with him and companion Pearl Mackie) was too good to pass up. This would be our family ritual I decreed, to meet your Doctor as a boy and make a lifelong bond. The wee guys were rightly mesmerized, and I scored a few bonus points for gassing with Capaldi so long the photographer had to intervene (the old Glasgow School of Art alumni connection, it’s almost masonic you know). Daddy is totally besties with The Doctor (thanks Peter!). Pearl Mackie’s character Bill Potts helped smooth out the roughness of Capaldi’s Doctor, inverting the usual line “it’s bigger on the inside” to “it’s smaller on the outside” when describing the TARDIS. It’s the sort of quip that characterized her charm and helped ensure she became a quirky fan favourite. Bill, a black lesbian, would receive a louder cheer than The Doctor when she took to the stage that day. Oh, we have come a long way. I’ve come a long way too. Since January, my spacial dimensions have changed too. Twenty centimetres of intestines was cut out of me. I’m smaller on the inside. It brought its own set of discomforts, but they’re nothing to complain about given where we could be instead. It bought me precious time. When you’re presented with several life-threatening moments in quick succession, you think about time a lot. How much have you got left, what are you going to do with it? You lord over your time. Next month I’ll take Casper to a screening of a 70mm print of 2001 for its 50th Anniversary. It’s important for his writing to experience this movie, as Kubrick meant it to be seen. I’ve got this blog, and Casper has his Sci-Fi novel. He’s ten years old but has more commitment to his writing than I have. He found time to submit to the local writing Award, whilst I languished in the doldrums and failed to submit anything, cycling into bins instead. Introducing Casper to 2001 is something I can do for him, to share my love of its aesthetics, it’s pacing, it’s framing, it’s dialogue. This is what I want to do with my time, share an appreciation of storytelling with my boy. It’s what you pass on. I think you know what the problem is just as well as I do. Time is a luxury. We all need more time to pass on a lifetime of accumulated knowledge and passion. We need more time with our families, more time to love, more time to create. Doctors too need more time, more than we give them. After my stroke, I had a transthoracic echocardiogram and a transesophageal echocardiogram to find out if there was a problem with my heart. The latter is quite invasive. It requires a camera being fed down your throat to photograph your heart. It requires sedation and recovery time. It’s time-consuming. Nothing further came from these tests. They were dead ends. Footscray Hospital sent me on my way. We found nothing. We can’t tell you what went wrong, they said, you’ll just have to accept that you will never know why or how it happened. Since you are otherwise quite healthy, we can’t even advise you how to avoid another one. 60% of young stroke victims never find out the cause and are left to spend the rest of their lives wrapped in anxiety. I was referred to Cardiologist Tony Walton as The Epworth. Within two minutes of meeting my new Doctor, he had confirmed a 4mm hole in my heart, large enough for a DVT to pass through. He also thought that the long haul flight I’d taken only five weeks before the stroke probably caused the DVT. The hole was concerning enough for him to recommend an operation to close it. Urgency kicked in and in less than two months I was on the table talking to Tony and watching the live feed on a screen next to me as an Amplatzer device was opened like an umbrella in my heart. It occurs to me now that Footscray Hospital went through all the motions of ordering the various time consuming, expensive tests (CTs, ultrasounds, MRIs, X-rays, echos and on and on) but hadn’t had the time to sit and study the results. They were just going through the motions. They were killing time 'til they could get me off their books. They were killing me. Nobody looked at what the results were. No time. They also dismissed the possibility of a DVT because they point blank wouldn’t consider any possible cause outside of a four-week period, and my last flight had been five weeks prior. Four or five weeks, it’s all relative. If a blood clot can hang around your heart for four weeks, why should five be impossible? Footscray failed me twice because of time barriers they imposed on themselves. And then there was the third failure. They told me I would be wasting my time seeing a Cardiologist. I don’t think they understand what time means to someone living on a borrowed account. Christopher Nolan was recently interviewed about the anniversary restoration of 2001.“You know what is happening at the end only because you feel it; the experience is the point.” I couldn’t agree more. We’re coming up to cycle seven. The fatigue lag is catching up with me now. It’s like there’s a time delay. With every cycle, it lasts just that ickle bit longer. My limbs feel weak like someone has hollowed out all the flesh inside with an ice cream scoop. I’m empty inside. Drained. There’s hardly any substance to me. There’s also been some added complications, most notably a large swollen vein near my port. A trip to A&E revealed that whilst this vein itself was superficial, it was an indicator of more serious clots in the tissue below, caused by the trauma of having the port inserted. It’s apparently quite common, but we can’t let it go untreated as clots in the arm have a nasty tendency to wriggle down to the lungs. It's a Friday night, so the Emergency Doctors began the paperwork to admit me into the hospital for the weekend. I said that wouldn’t do, we were going to see Belle & Sebastian that night, and it was a rare chance to catch up with old Weegie pals. The Doctor nodded. He understood my predicament. He was after all an electric guitar playing Doctor himself. I was given a shot of Claxene in my guts and a script for 10 more syringes. If I could arrange for an injection twice a day I was free to go. No clinics would be open over the weekend so I’d just have to rock up to any nearby A&E twice a day and ask them to stick me. Bit of a hassle, but better than the alternative. We stayed in St. Kilda on Friday night for the gig, so headed to nearest A&E at The Epworth on Saturday morning. Now, I did not know there was such a thing as a private A&E. Here’s what is wrong with our two-tier health system is one easy lesson. At Ballarat Hospital, a public A&E, the waiting room is always overflowing, wait times are excruciating and there is always a lingering threat of violence. Last time I was there, two guys in the waiting room were discussing the bullet their friend had taken. Meanwhile, someone else was losing their temper with the Triage Nurse. It doesn’t feel safe. But head to the Epworth, and it’s surreally quiet. Almost clinical. It might as well be Dave Bowman’s final bedroom. Not a thing out of place. There was only one person in front of me in the queue. Within five minutes I’d had my shot. But it’s a private A&E. So whilst on this occasion, they were happy to bill Medicare, it would still cost the taxpayer $300. I’d just like to apologise to everyone for that right now for that insane bill. I very much doubt that Ballarat A&E can claim the same amount back. And yet, it’s your taxes and mine that subsidise the private hospitals and private insurance industry. The real cost of a two-tier system is overflowing emergency units on one side of town, and empty luxury ones on the other side. In an emergency, time is everything. How many people have lost a bet on making it to a cheaper, public A&E? This is the system we live and die by. We’ve made this world out of an infinite number of possibilities. Do you think I don't know the difference between an internal fault and an external influence! No, no, no, there's something going on here. Some dirty work they won't touch with their lily white hands! (The Brain Of Morbius). My next trip to A&E was in Bacchus Marsh later that night. They took the time to train me in injecting myself. Rather than the time-starved technique of Ballarat A&E, I learnt to take my time, learnt a ritual I could follow with meditative precision. Wash your hands, slowly and methodically. Peel back the packaging on the syringe. Wipe down the area you are going to jab with a sterile pad in smooth circular motions. Do this for a minute. Longer if you want. Let the area dry naturally. Then remove the syringe cap, tap the air bubble to the top, pinch your skin and insert, confidently, firmly, don’t hesitate. Now before injecting the liquid, pull back and see if any blood comes out. If it does, remove and start again somewhere else, we’re not going into a vein, just the subliminus tissue. If all good, slowly depress the end of the syringe. Take your time, pushing in slowly. Slow. Slow. Once it’s all in, remove the syringe and carefully place in the sharps bin. It’s all very circumspect. Now compare that to what happens in a hospital. One quick wipe, jab, push, done. My method takes 5 minutes, theirs 10 seconds. I have the time, they don’t. The difference, however, is evident all over my abdomen. The injections I had done in hospitals all bruised up in huge purple blotches. The ones that I did are tiny blemishes by comparison. Claxene will bruise the tissue, but with a modicum of care, a mere soupcon of patience and the difference is literally clear. 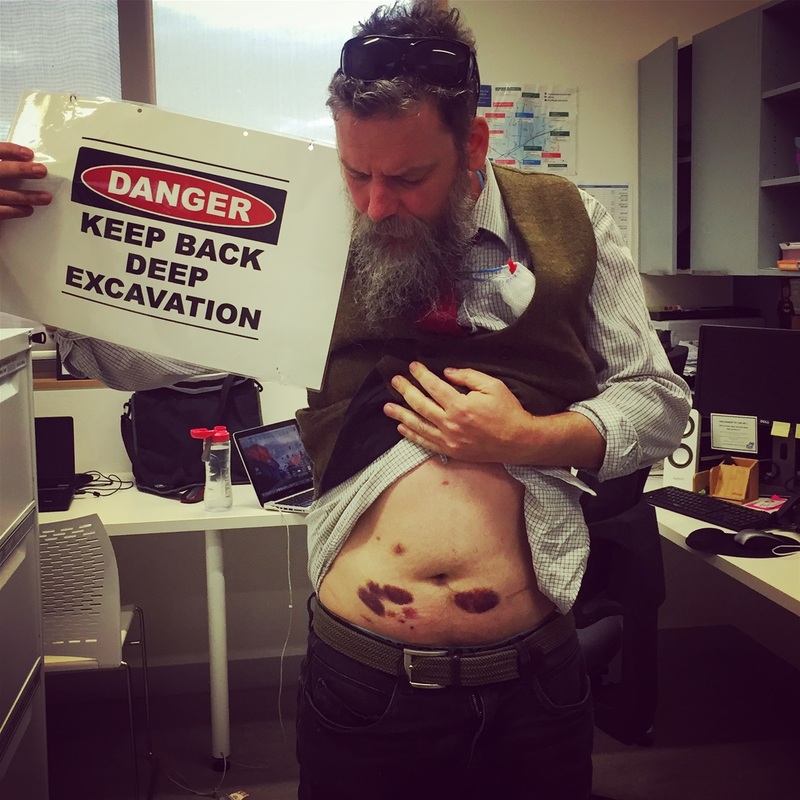 The hospital injections spread bruises so far and wide that it meant I had very little available space left to work within on my belly. I was going to have to start injecting into bruises. Fortunately the next week the Doctors took me off the Claxene and put me onto Xarelto tablets. I’m pretty proud of myself for managing the injections though, given that I can’t watch someone else sticking me. I was almost disappointed to be giving them up. Almost. I won’t miss the bruises though. The kids are fascinated by my bruises. Huey runs a finger around the lenticular galaxies that spiral across the infinite expanse of my guts. A few shining white dwarfs of clear skin poke out the arms of the blue and purple magellanic clouds that drift over my abdomen. They move that close to each other that I’m sure if we stare long enough we’ll witness a cataclysmic collision. “My God, it’s full of stars,” says Huey. That’s another ticket for The Astor I’ll be booking then. I’ll fly them both to Discovery One. How can I deny their little faces? I orbit their stars. Their tide pulls me one way, then another. And then, in dark abyss of the auditorium, the velvet curtain rises on the event horizon. Everything with weight settles like dust as a vast silence radiates from the chandelier moon. Darkness descends as a monolithic block; the distant ribbon of phone screens blink off one by one, replaced by crinkling and rustling. Someone shooshes from a few rows back. We’ll take my ice cream scoop and use it this time for cones. A Chocolate, a strawberry. Maybe coffee for me. Ahhhhhh, well how about a nice jelly baby instead? Just for a moment, there is only a stillness here reflected from the heavens above us. Just for a moment, we have all the time in the world. Now that they've changed the advice and we're supposed to exercise through Chemo, the 5am starts are back on. Whilst we’re talking about time, I just wanted to take a moment to acknowledge the passing of Scott Hutchinson from Frightened Rabbit. I can’t claim to have ever known the man, but his music was there for me when I needed it. In the weeks after my stroke, I took up running and followed a Couch to 5km program, and his music made all those bitterly cold, dark and dank 5 am starts that bit easier. They were perfect songs to run to, solid chugging anthems that build from a familiar downtrodden Scottish lilt to soaring crescendos that lifted the spirits and if timed correctly, meshed with a sunrise over the oval into perfection. I would wake each morning with the same symptoms of a stroke, a dead arm beneath me, twinges in my face. Every time I awoke, the after tremors brought a panic attack, but still, I had to find the strength to stumble out into the cold night air. It was a matter of survival. I’ve been lucky enough to see the Frabbits twice, including last year, sandwiched between two Teenage Fanclub gigs. At the time of the last gig, I was feeling very reduced, a shell of the person I had once been. The stroke had made me small. Scott was the absolute antithesis of how I felt and I fed off him. He was an antidote to my stroke, a miracle drug. He was booming, larger than life, a little pished and having a very, very good time. It was easy to anchor myself to that. I wanted to be a part of it. He helped me find way back to wanting to participate in a life outside of myself again. Behind the scenes of Glasgow School of Art Students Association where I spent ten years in one capacity or another, I was to sadly witness to far, far too many lives cut short by depression and mental health. Many were barely noticed missing, classmates assuming they had dropped out or moved away a long time ago. It’s for them I feel most sorry. Others would be remembered and mourned. Some I knew, sometimes well. More than once I would have to speak to the Police as the last person to see someone alive. Each event was shocking, but perhaps on reflection, not entirely unexpected. Yet Scott’s passing has affected me greater than those that came before, perhaps because it seemed so out of character from the persona he projected. I am heartbroken to think that whilst he was giving me the strength to plough on, one foot in front of the other through the darkness, he was lost in his own battle and one that he would ultimately lose. My heart goes out to all who knew him and loved him. So let us all make a pact. Let’s take the time for those around us. Never assume people are coping. Never assume they are fine. Assume everyone is fighting a battle. Never say something hurtful when a kind word can be said instead. Never say ‘Cheer up, it might never happen’ because it probably already has. We are the most connected generation ever yet paradoxically also the most lonely. Check in with someone today. Don’t cancel that coffee next week. Send someone a book you think they would enjoy. Let them know you are thinking of them. We each have such little time, so don’t hoard what you have, share it and make it count. It’s the best gift you can give, and it doesn’t cost a thing. And can I make a suggestion? 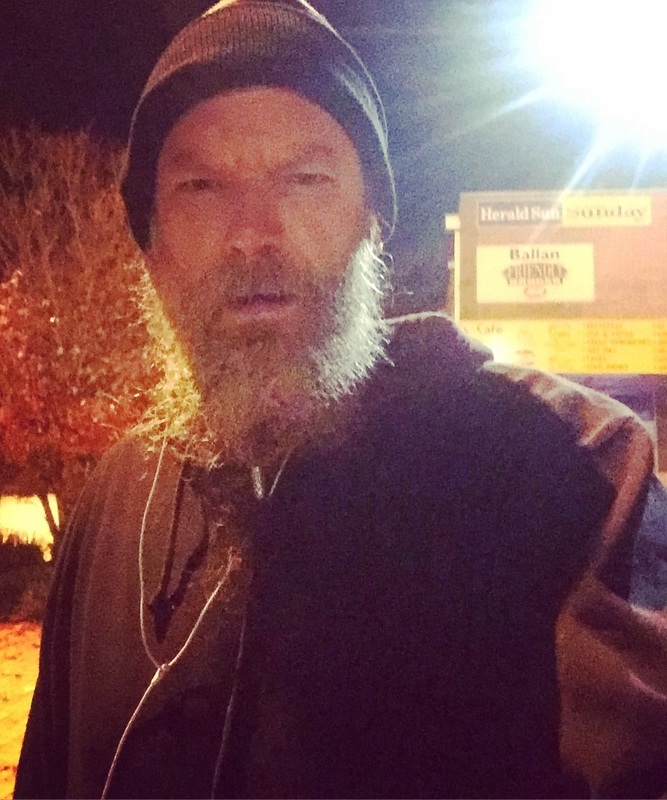 Put your runners at the door, set an alarm and head out tomorrow morning for a run. It might help chase the darkness away. I put my runners on again this week. I didn’t get very far, but I just wanted to chase the feeling again. My knee isn’t best pleased, but it will cope. I ran to my Doctors surgery with “Get Up” timed to coincide with the rising sun. And then crucially, I ran home without stopping in. I needed that. Thank you, Scott. You sang about depression, but I always thought - it always looked - like you could cut the clouds in two. We’re all a little smaller on the inside now.